Sometimes I sit and reflect on the journey of the past three months, and wow, what a ride! By now, a whole lot of people have knee-jerk reactions when it comes to mentioning the Namibian desert elephants. Thanks to the support of people on dedicated Facebook pages, every single person who has signed the petitions, or seen the international media about it including television coverage in the U.S.), the world has now woken up to the reality of what is happening in Namibia. Those who support "killing for fun" will defend their bloodlust at all costs, as will those who by association earn an income in some way from the trophy hunting of magnificent beasts. I wonder what they will do when all the trophy animals are gone and, at this rate, that is becoming possible way too fast. A classic pro-hunting argument is that anti-hunting advocates are driven by emotion and unable to think logically. I actually think that emotion is essential, because emotion is energy in motion. This is what gets things changed. As for logic, I have yet to find any economist who will vouch that massacring up to 10 percent of a limited population of rare desert elephants makes economic sense. With nine permits being issued, I don't care whether the total population numbers are 100 or 391; it is not sustainable, it is not good business sense, and it makes no environmental sense. I have yet to be presented with actual figures from a desert elephant trophy hunt that illustrates exactly where the money goes. The Pro-Killing for Fun brigade keeps on ad nauseum, trying to convince the rest of the world that the money goes into the communities for conservation and upkeep. But we have no proof, for instance, that in the killing of Delta that the community received any benefit at all, aside from one or two meals. And even in this respect, unhappiness still reigns with certain community members publicly having complained that they did not receive any meat. There are even rumors that certain community leaders sell the elephant meat to the locals. Not to mention the allegations of illegal hunting by certain hunting concession holders within the conservancies. Throughout history, it is always a shift in awareness and then public opinion that shape practices previously deemed acceptable, exposing them and ultimately branding them as absolutely unethical. While Facebook has not abolished slavery, ended apartheid or the war in Vietnam, social media made it so much easier to spread awareness. Daily there are small victories in our newsfeeds, such as the outcry against the Namibian black rhino permit purchased on auction by the Dallas Safari Club in January and the marches for Lions in March which globally raised awareness of canned hunting to unprecedented heights. Huge victories also include the bans on trophy hunting in Botswana and Zambia, on elephant trophies imported from Zimbabwe and Tanzania to the U.S., and on several critical trophies to Australia. These have all first been highlighted by social media, and awareness of these issues went viral almost overnight. The downside of these victories is that the countries that still allow trophy hunting exports, such as Namibia and South Africa, are now being marketed as hunting destinations with lots of things to kill urgently if you have enough money before they ban it. The remaining trophy animals are sold much like in a fire sale - all must go. In some adverts it is even marketed as "do it now, while you still can." The Killing-for-Fun brigade hates this exposure. They wanted to keep their dirty little psychopathic secret safe; they wanted to use Facebook as their own personal virtual kill-room galleries. They are screaming mad at us, and they get increasingly abusive and violent as more and more light gets shone on exactly how deep the corruption and psychopathy goes. As the exposure escalates, I find it fascinating that the researched findings of organizations such as Desert Elephant Conservation (which illuminates elephants' low, low numbers, and suggests the reduction of adult mortality as a counter-measure, i.e. no hunting) are being ignored by those who want to kill, photograph the corpses, and stuff them. Popular opinion and public awareness include support from respected researchers ElephantVoices, and Animal Defenders International, along with several other international organizations, such as Born Free Foundation and Conservation Action Trust. Recently, an article was published in the Namibian Sun wherein Namibia's Minister of Environment and Tourism Uahekua Herunga blamed the decrease in tourism to Namibia on the fears of Ebola. But we know better. We have never called for a boycott of tourism to our beautiful Namibia. But people are not as stupid as Minister Herunga might assume. They would much rather take their money to a country that is not hell-bent upon wiping out an entire population of unique animals that they paid top dollar to come and see. Elephants are not ours to use and abuse. They are divine blessings bestowed upon this earth, entrusted into our care, not for our carnage. They are a gift to this earth with a wisdom and understanding that far exceeds that of humans. They love, they mourn, they weep, they teach, they improvise, they survive, they tolerate, and they adapt. But they cannot adapt to extinction. There is a black side and a white side to this debate, a low road and a high-road. And then there is there is a Grey Road. 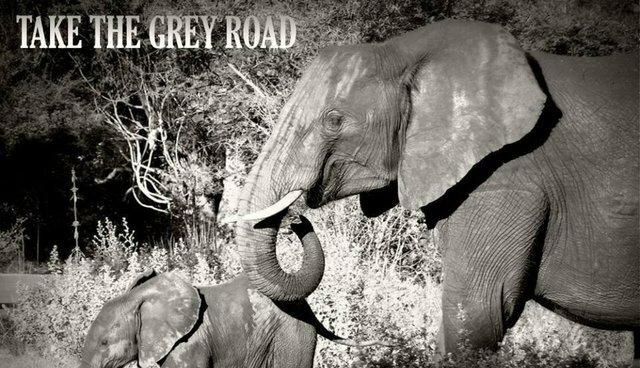 That is the Road that protects our Elephants. That is the Road that spreads awareness on the unconscionable abuse and murder of a finite natural resource. That is the road to take.